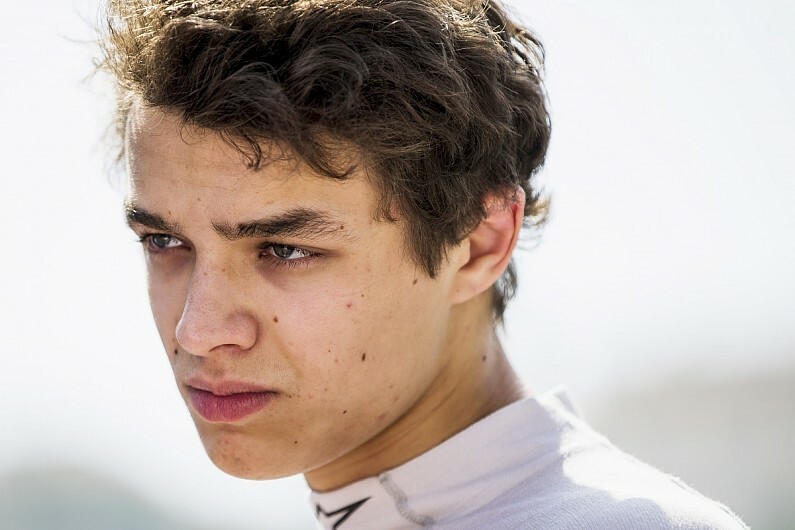 Lando Norris believes he is “lucky” to be leading the Formula 2 championship, with the McLaren Formula 1 junior blaming a number of “mistakes” for not having a bigger lead. Norris, an F2 rookie after winning the 2017 F3 European Championship, has 98 points and is 27 if front of his joint closest rivals, Artem Markelov and Alexander Albon. The Carlin driver has not finished outside of the top six in the eight races held so far, but believes a number of qualifying errors have robbed him of further points. “Qualifying has always been my forte on a race weekend,” Norris told Autosport. “I’ve always qualified at the front and therefore been in a good position in races. “But in F2 it’s been quite the opposite, my race pace has been better and I’ve struggled in qualifying. “The car has been very good, I’ve just made a lot of mistakes. Even when I’ve got pole I still made mistakes. “On race pace, Carlin, in most of the races, we’ve been very strong. “All the races we’ve been very confident, but I’ve always worried going into qualifying. I need to clean that up and have less mistakes. After crashing in qualifying last time out in Monaco, Norris scored sixth from 17th on the grid in the feature race, despite a crash with Ralph Boschung and a resultant drive through penalty, and then took third in the sprint race. But as Markelov was the only one of his rivals to register a double-digit score – Albon, Nyck de Vries, Jack Aitken and George Russell all registered at least one DNF – the crash cost Norris the chance to extend his lead further. “I benefitted from them retiring and managed to score some points,” Norris added. Norris has undertaken test and development work for McLaren in his role as reserve drive for the team, with many tipping the 18-year-old to be the next Brit to reach Formula 1. He was also recently linked with a surprise early graduation to F1 with Toro Rosso in place of Brendon Hartley. Asked if the pressure of his link with McLaren was affecting him in F2, Norris said: “I don’t feel under pressure in the moment. “There’s no thoughts going through my head that I have to do this. “This year, I’ve made the mistake and the pressure comes after – I’ve thought ‘that makes me look bad’. I don’t feel it before. “It’s not like they are massive errors, I’m just sometimes pushing too hard in the wrong areas. It’s not because I feel I have to nail it.